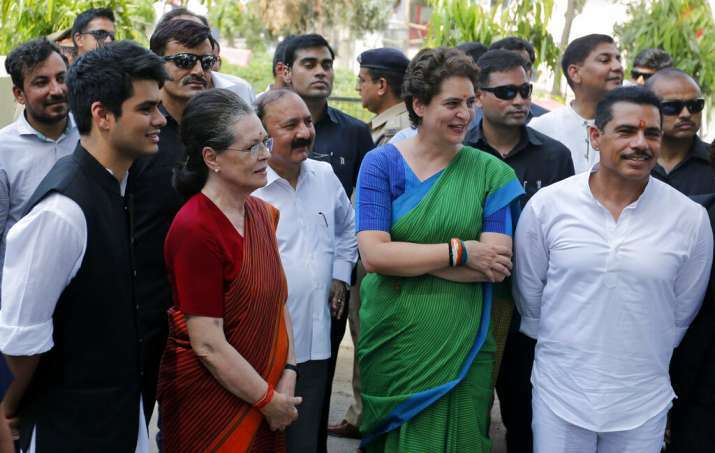 Congress party leader Sonia Gandhi, second left, stands with her daughter and party General Secretary Priyanka Vadra, her son-in-law Robert Vadra and grandson Raihan Vadra after filing her nomination papers for the upcoming general elections in Rae Bareli. 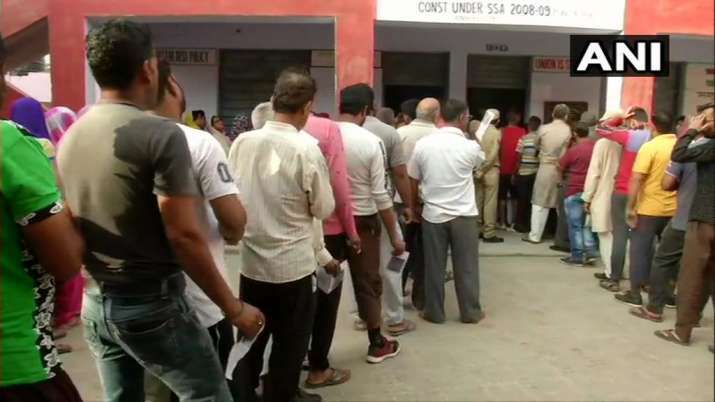 The 2019 Lok Sabha election began on Thursday morning -- with the commencement of phase I of polling. Nearly 14 crore people are eligible to vote in phase 1. 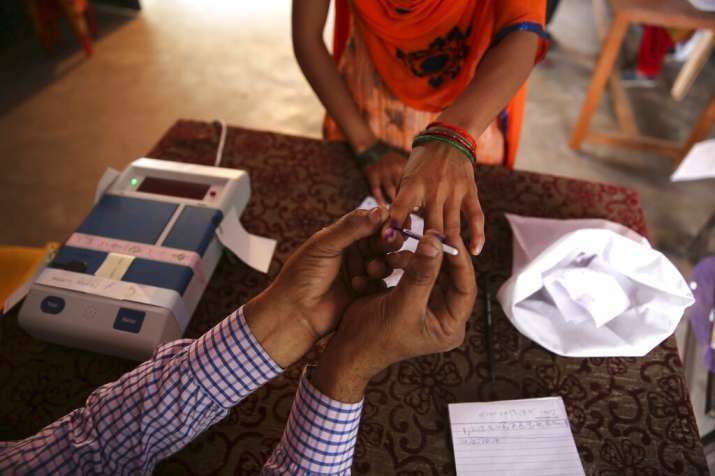 Voters in 91 out of 543 Lok Sabha seats will cast their votes today. A total of 1,279 candidates are in the fray in the first phase of the general election. Voters across the country will decide who will control the Lok Sabha and four other state assemblies. The 2019 Lok Sabha election is being conducted in seven phases and the results will be declared on May 23. At the time of filing this story, 25 per cent voter turnout was recorded in Tripura; 22.84 per cent voting was recorded in Telangana; 23.78 per cent in Uttarakhand; 23.10 per cent in Lakshadweep and 13.7 per cent in Maharashtra (7 seats). Image Source : AP PHOTO/MAHESH KUMAR A. 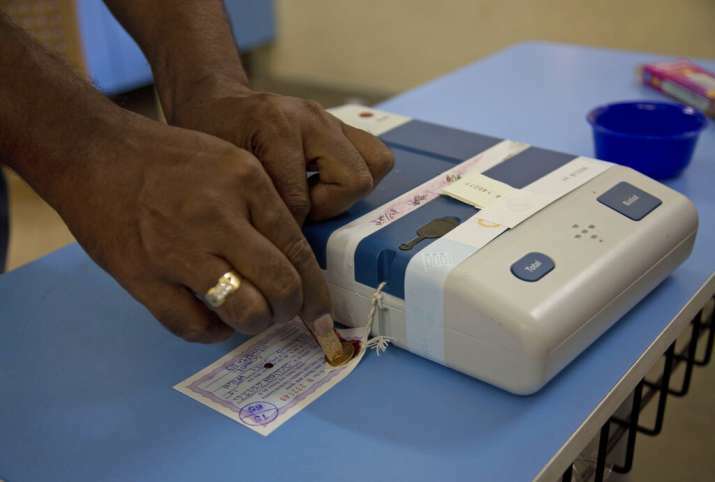 A polling officer seals an electronic voting machine at the end of the first phase of elections at a polling booth in Hyderabad. 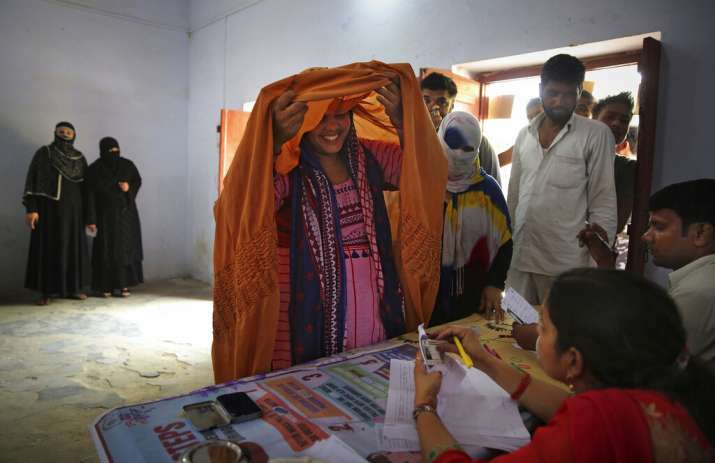 A Muslim woman lifts her veil to identity herself to a polling agent before casting her vote in village Shahpur near Muzaffarnagar, Uttar Pradesh. 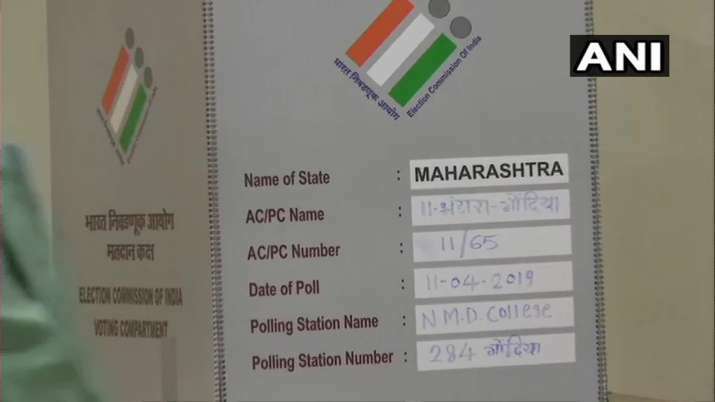 Maharashtra: Preparation underway for LokS abha Elections 2019 at booth number 284 in Gondia for the Gondia parliamentary constituency. Maharashtra: Preparation underway for polling. 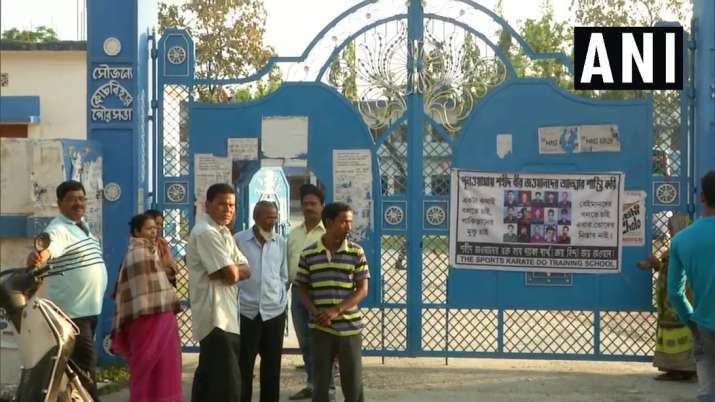 West Bengal: Polling booths 173,174 and 175 in Coochbehar, ahead of the voting for Lok Sabha Elections 2019. 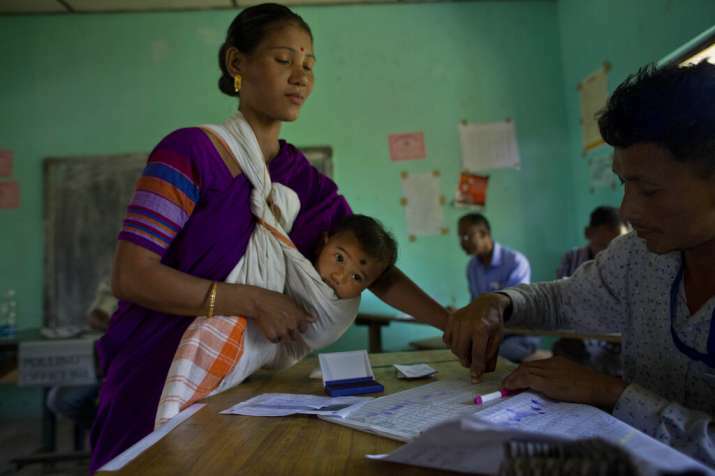 A polling official collects the thumb impression from a Mishing tribal woman carrying an infant during the first phase of general elections in Majuli, Assam. 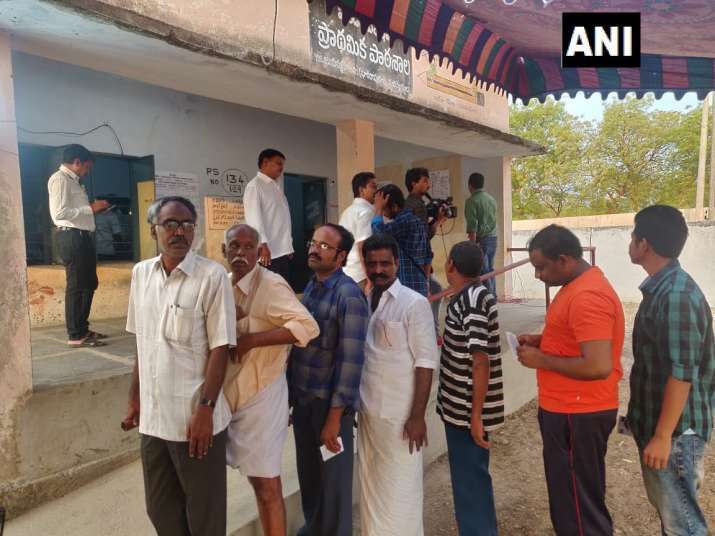 Andhra Pradesh: Voters queue outside polling booth no 134 in Pulivendula, ahead of voting for the first phase Lok Sabha Elections 2019. 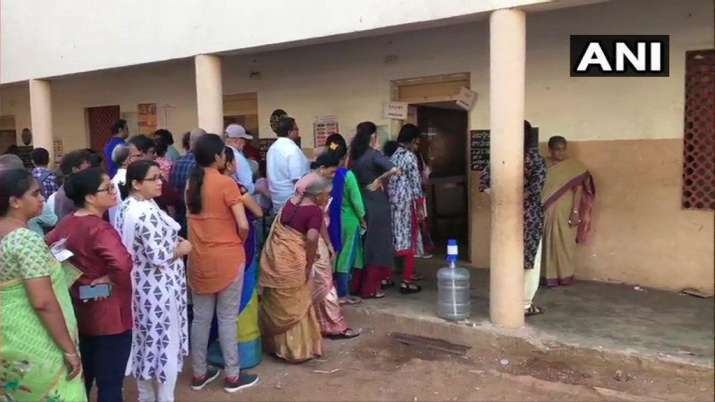 Andhra Pradesh: Visuals from a polling booth in Vishapkhapatnam as voting begins for Lok Sabha Elections 2019. 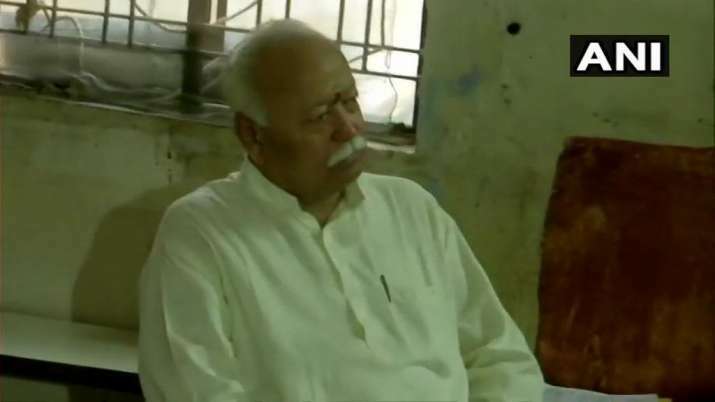 Maharashtra: RSS Chief Mohan Bhagwat present at polling booth number 216 in Nagpur, to cast his vote for Lok Sabha Elections 2019 . 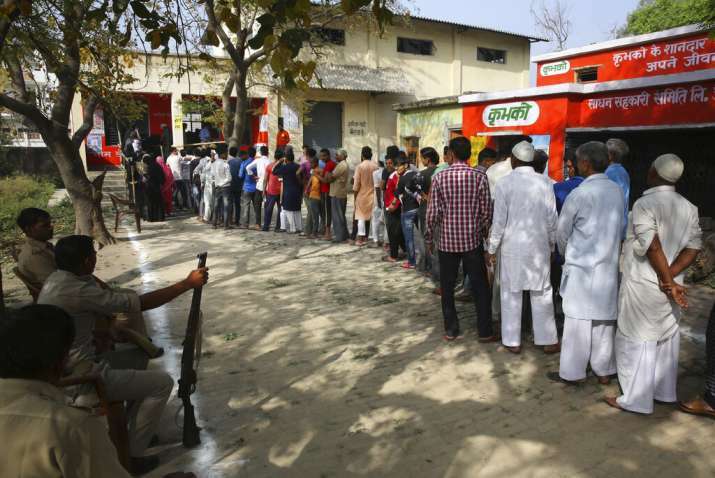 Jammu & Kashmir: Voters queue up to cast their vote for the Lok Sabha Elections 2019 at polling booths 15 and 16 in Gandhi Nagar. 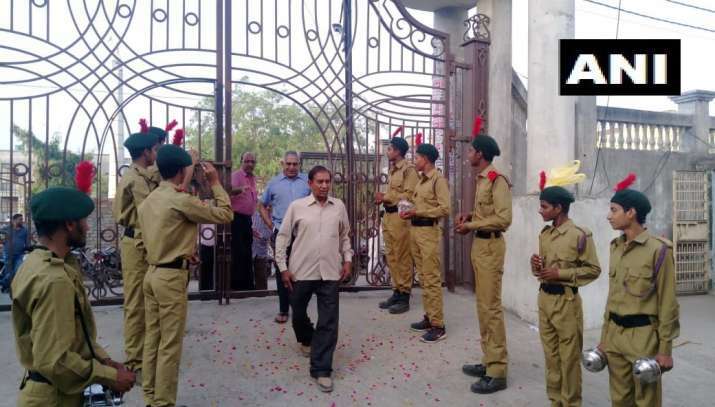 Baghpat: Flower petals being showered and dhol being played to welcome voters at polling booth number 126 in Baraut. 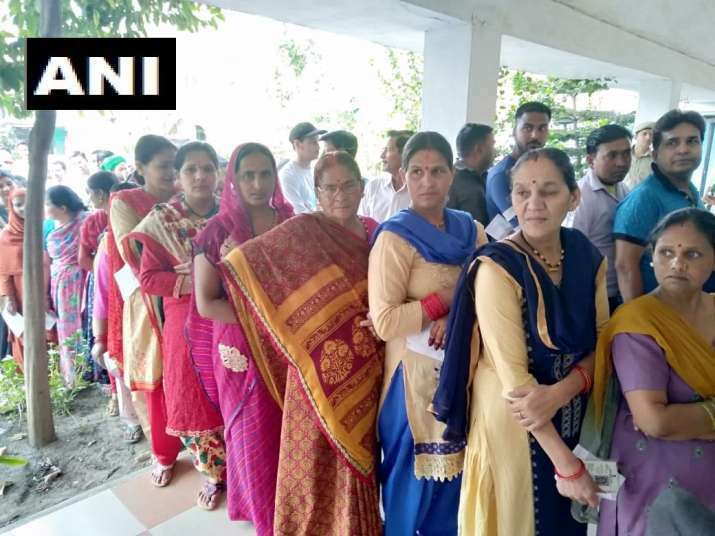 Uttarakhand: Voting underway at booth number 4 in Haldwani for the Lok Sabha Elections 2019. 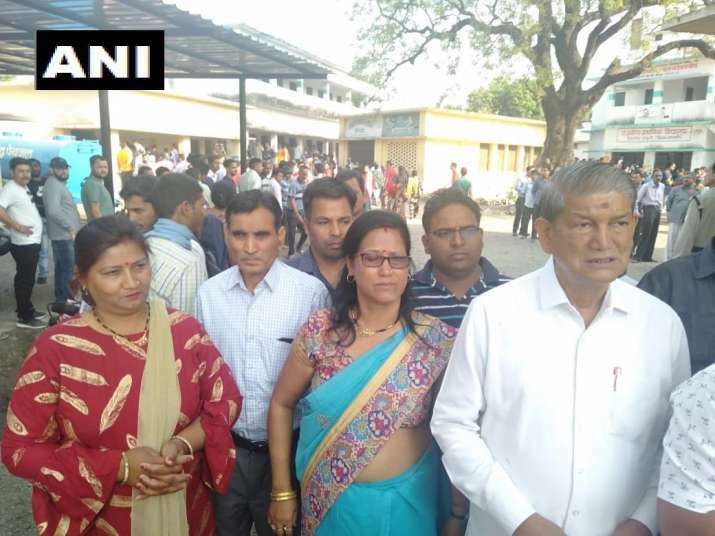 Uttarakhand: Former Chief Minister Harish Rawat queues up to vote for the Lok Sabha Elections 2019. 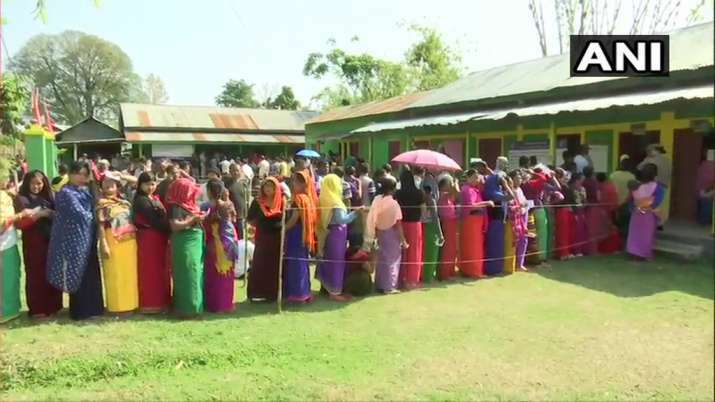 Manipur: Voting underway at a polling station in Imphal, in Outer Manipur Lok Sabha constituency. 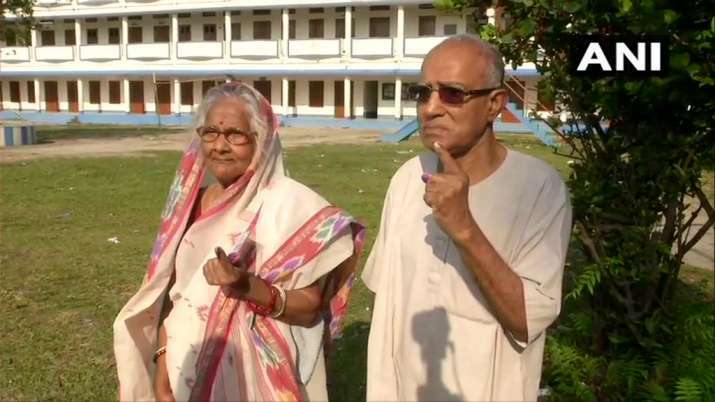 West Bengal: Senior citizen voters cast their vote at a polling booth in Coochbehar. 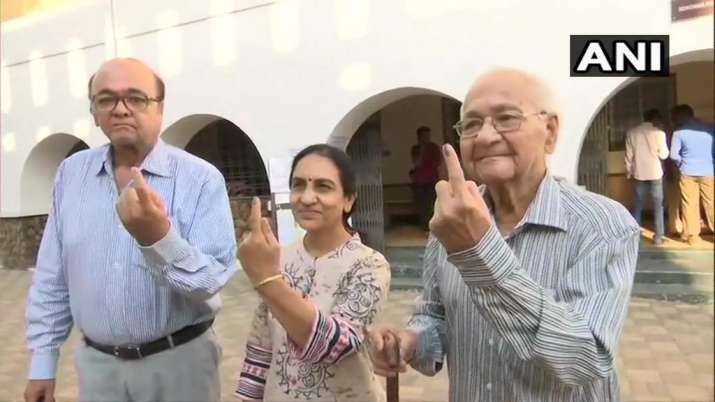 Maharashtra: A 92 year old voter DN Sanghani accompanied by his son and daughter in law after casting their votes at a polling booth in Gondia. 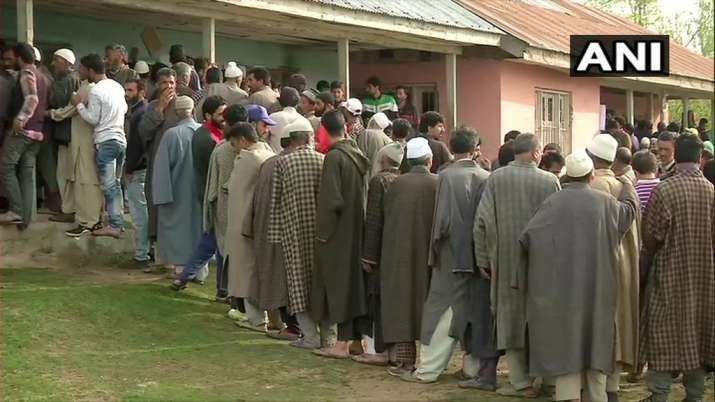 Jammu & Kashmir: People queue at polling booth number 114 & 115 in Bandipora, to cast their votes for Lok Sabha Elections 2019. Image Source : (AP PHOTO/MAHESH KUMAR A. 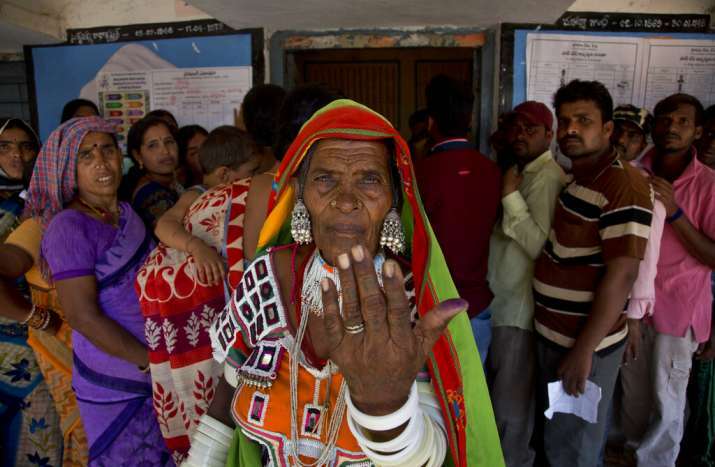 An Indian Lambada tribal woman shows the indelible ink mark on her index finger after casting her vote at a polling boothduring the first phase of general elections in Hyderabad. 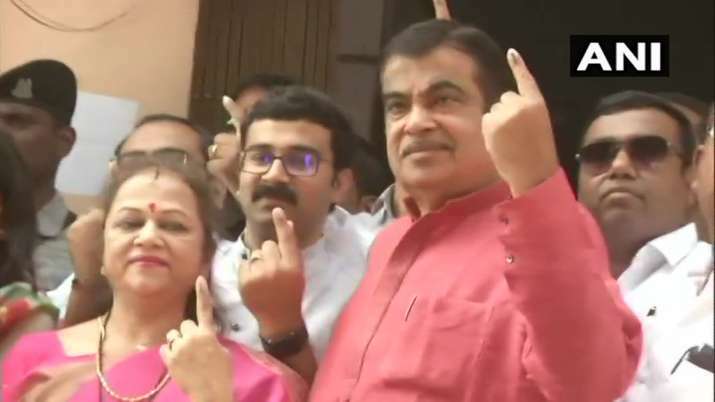 Maharashtra: Union Minister Nitin Gadkari cast his vote at polling booth number 220 in Nagpur parliamentary constituency. 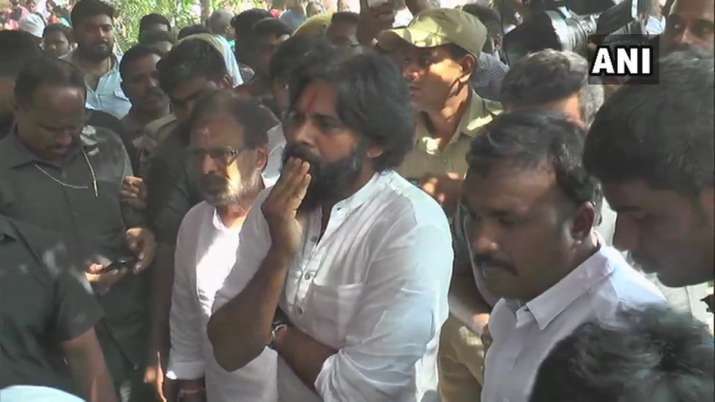 Andhra Pradesh: Jana Sena Chief Pawan Kalyan at the polling booth set up at Chaitanya School in Vijayawada.